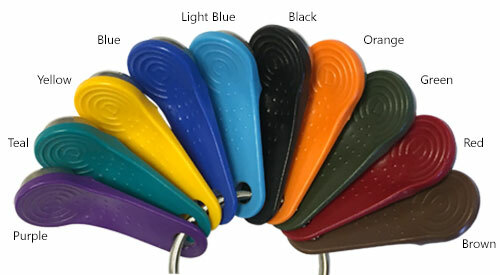 We offer keyfobs complete with our standard iButton (DS1990) in Black, Green, Red, Yellow, Blue, Orange, Brown, Purple, Teal and Light Blue, or packs includng all 10 colors. These keyfobs—also known as keytabs—work with any device that uses the iButton, including TimePilot's time and attendance systems and door locks. The standard DS1990 iButtons carry a lifetime warranty, and are sold in packs of 5, 10, 30, 50, 100 and 200. The more you buy, the more you save over the 5-pack price. In many cases, the iButtons' serial numbers will not be visible. To learn how to assign these iButtons to employees, please see this page in the Support Center. If you need less common models of iButtons or iButton parts, please visit iButtonSource.com for a complete selection. Buy Now You'll choose your color and quantity on the next page. TimePilot Corporation warranty*: TimePilot iButtons carry a lifetime warranty. If one ever stops working, return it to us for a free replacement. The purchaser pays only the shipping to return the malfunctioning iButton to us. *Note: The money-back guarantee and warranty are void if the system is returned in a damaged state for any reason, including damage that occurs because of failure to follow installation instructions. If you choose to use your own cable to connect a TimePilot Standard timeclock to your PC, you could damage your system and will void all guarantees and warranties, express and implied.